Known for its golden sands and crystal waters, the Maldives is perhaps not the first country that springs to mind when one considers locations lacking in religious freedom. However, for more than 10 years the island chain in the Indian Ocean, south-west of Sri Lanka, has been in the top 10 of Open Doors International’s World Watch List, which details the countries where it is hardest to practise Christianity. Tomorrow (September 7), the country’s almost entirely Islamic population will head to the polls for only the second two-party election of Maldivian history. Yet regardless of the outcome, little improvement is expected in religious tolerance. 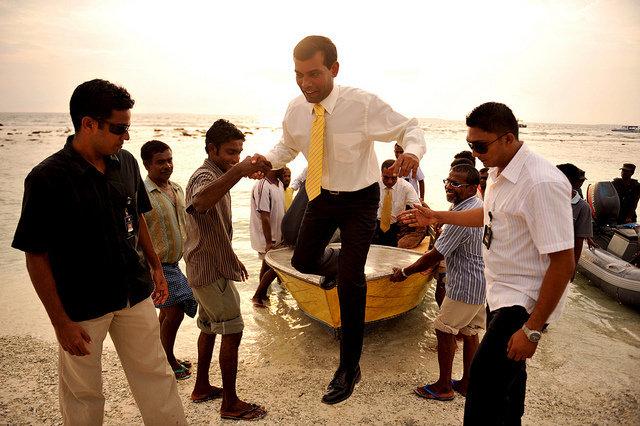 The incumbent president, Mohamed Waheen Hassan, has been in power for just 18 months, since his prime opponent tomorrow, Mohamed Nasheed, claims he was forced to resign in February 2012. Hassan was vice president to Nasheed, who claims he was overthrown in a coup. Hassan denies this, saying Nasheed chose to resign. Whatever the precise circumstances, Nasheed left his post following accusations by his opponents that he was intent on “wiping out” Islam from Maldivian life. The Wall Street Journal reported that “his political adversaries fomented opposition among conservative Muslims by claiming Mr. Nasheed’s government was trying to undermine their faith”. The other two candidates in tomorrow’s elections are former president Maumoon Abdul Gayoom’s half-brother, Abdulla Yameen, and prominent businessman Gasim Ibrahim. Yameen wants the implementation of the death penalty and harsher prison sentences, while Ibrahim promises to strengthen Islam in the Maldives, including the establishment of an Islamic university and making the Quran a mandatory school subject. Islam is so intertwined with politics in the Maldives that it is the only country in the world where it is illegal to be anything other than a Muslim. Those who convert to another religion can have their citizenship revoked. As such, there is no formal presence of any other religious faith inside the country, although small pockets of underground religious movements exist. Aside from matters of religion, the new president will have his hands full with economic and social problems, not least widespread drug addiction among the Maldivian youth and hundreds of millions of dollars in national debt. The New York Times reported in 2010 that as many as 50 per cent of young people in the Maldives are addicted to heroin. Meanwhile, sexual abuse of young people is rife and divorce rates the highest in the world. The economy relies almost exclusively on tourism, but less than one third of the population is employed and the country depends upon regular loans from abroad. Perhaps the country’s prime unifying factor is Islam, and political leaders such as Hassan use their faith for popular support. In April last year, Hassan said the country’s development must be informed by Islamic values and customs. “Islam is the most civilised religion,” he said. Maldivian Chief Justice Ahmed Faiz Hussein said a silent protest for religious tolerance in December 2011 “shocked the nation” and indicated the weakening of the country’s Islamic faith. Meanwhile, the country’s youth lead cries for the full implementation of sharia law, which, if applied, could lead to the death sentence for apostates. Regardless of the election result, the World Watch List report is pessimistic over the potential for increased religious freedom. “Given the sternness of the government and the support it enjoys by Maldivian citizens, it cannot be expected that there will be substantial changes in the years to come. The government will most likely become increasingly strong on all factual or imagined divergences,” the report states.